We remove all dirt and debris from the asphalt with power blowers, scrapers, and brushes. Debris can consist of dirt, dust, grass clippings, mulch, pebbles, moss, and small puddles. We then treat all fresh oil stains with a seal primer. The primer covers the stains, and permits the sealer to bond with the asphalt. Old oil stains are easily covered by our sealer, and therefore do not need to be primed. 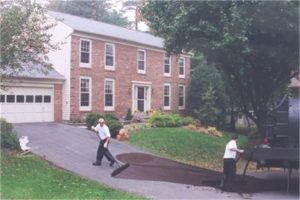 After properly preparing the asphalt, our experienced Sealcoat Technicians apply a coal tar emulsion to your driveway with horse hair brooms. In just 24 hours your driveway is ready for use. We use coal tar sealer that forms a tough, durable, and flexible coating that protects asphalt pavements from the damaging elements of weather, water, salts, gas, and other chemicals. Our Sealer is composed of high temperature refined coal tar pitch and select mineral fillers and surfactants. Most companies apply sealer with spray units instead of by hand. Spraying the sealer can produce a much thinner coat which reduces the materials costs for these companies. Hand sealing provides a substantially thicker coating than even two coats with spray. In addition to being thin, spraying can be messy, and leave black tar on brick, concrete, and your garage. Our experienced sealers spread the sealer from the center to the sides. Their skill and care ensures that your brick, garage, and concrete will be tar free. Our experienced Sealcoat Technicians use brushes made of horse hair to apply a thick, rich coat of sealer to your driveway. Don’t be fooled by the fast-talking door-to-door solicitors. Ask for your driveway to sealed by hand. Ask for your driveway to be sealed by Marty’s Sealcoating.